You may receive updates from North Carolina AFL-CIO, the sponsor of this petition. You may receive updates from Jeremy Sprinkle Sprinkle, the creator of this petition. Most people probably know North Carolina Labor Commissioner Cherie Berry from seeing her name and face posted in every elevator in the state, but arguably the most important responsibility of her department is to investigate when people are injured or killed on the job. Yet in all her years leading NCDOL, Ms. Berry has never held or attended a Workers’ Memorial Day service to mourn the dead and recommit to protect the living. 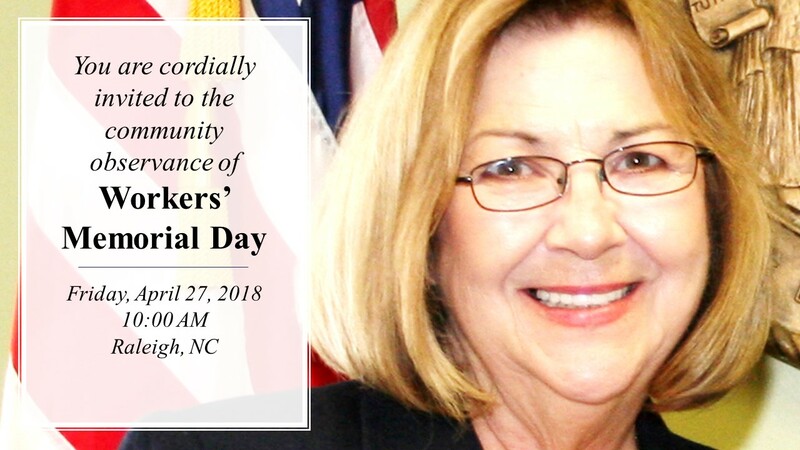 We the people of North Carolina cordially invite you to attend the next observance of Workers' Memorial Day, Friday, April 27, 2018 at 10:00 AM in Raleigh, and to join faith leaders, advocates, and other community members in memorializing those who have died while working for a better life.